Counting out a wad of crumpled notes, 50-year-old Muhammad Zahoor, owner of a small iron-welding business in Peshawar, capital of the Khyber Pakhtoonkhwa Province (KP), is full of complaints. “It is so difficult to get the rent from my tenants each month. Also they are noisy, and have brought four other relatives to live here. I just wish they would leave,” he told IRIN. To supplement his income, Zahoor rents the three rooms that form the lower portion of his flat to an Afghan refugee family who, he says, “refuse to leave”. “It is no longer easy to find people willing to rent rooms to us. We are sometimes late with rent only because it is hard for my sons to find work,” his tenant Abdullah Khan, 80, who came to Pakistan with the first wave of refugees in 1980, told IRIN. “Perhaps we have outstayed our welcome,” he said, noting that when they first arrived, Afghans, including his family of seven, were warmly received by Pakistanis. “We are Pashtuns, like most of the refugees themselves - and will never turn our back on our Afghan brothers. This is our tradition of hospitality,” said Ameer Arif, a transport company owner who hires both Afghans and Pakistanis to drive his coaches. “But it has been 30 years since they came, and perhaps they should return given the contest for jobs is tough, and many local people need them too,” he told IRIN. Sikander Lodhi, a Lahore-based economic analyst, said Afghans were good businessmen whose trade in cloth, embroidery by Afghan women, and other merchandise helped Pakistan’s economy in the 1980s. As “tough labourers”, they also helped the construction industry. But, Lodhi told IRIN, they aroused jealousy among locals. According to the UN Refugee Agency (UNHCR), relations between the 1.7 million registered Afghan refugees still based in Pakistan and local people are good. [Pakistan] Afghan refugees in Lahore - most want to stay in the Pakistani city after having built a life there. “The people and government of Pakistan have been generously and open-heartedly hosting and supporting Afghan refugees. There is a great deal of empathy among common Pakistani people for Afghan refugees,” Duniya Aslam Khan, a spokesperson for UNHCR in Pakistan, told IRIN. Still, refugees have placed more pressure on already limited infrastructure in Pakistan, like drinking water supplies. By collecting timber for cooking, they have contributed to the depletion of forests. In one case near Abbotabad, locals accused refugees living upstream of using water in streams to wash clothes, making it unsafe to drink for communities living downstream. So in 2009, UNHCR, together with the UN Development Programme (UNDP) and other UN agencies, launched the Refugee Affected and Hosting Areas (RAHA) initiative “in recognition of that hospitality which the Pakistani nation has been exhibiting for the past three decades,” Aslam said. In 2011, some 128 projects (59 in KP and 69 in Balochistan Province) in the areas of education (27), water and sanitation (47), health (25), livelihoods (6) and infrastructure (23) were launched in the provinces of KP and Balochistan, benefiting nearly 200,000 people, both refugees and hosting communities, and helping build their capacity in these sectors, UNHCR stated. Near Abbotabad, a city in KP, several people from a host community who had lived with Afghans since 1990 said new roads and schools had “further helped integrate everyone”, Khan said. 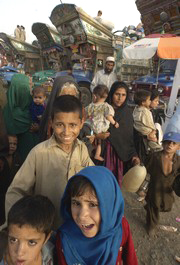 But despite the projects, UNHCR notes that many Afghan refugees in Pakistan continue to live in difficult conditions. “Some live in mud house settlements that look like the villages they left behind. In urban areas, few Afghan refugees are fully integrated and well-off. The majority of urban refugees are in slum areas of Pakistan's major cities, barely surviving on casual labor,” UNHCR says. In a 2009 report on Afghan refugees, the autonomous Human Rights Commission of Pakistan (HRCP) said official and popular perceptions of refugees have changed in response to altered geo-political realities. Once encouraged to join anti-Soviet Mujahedin forces, which were perceived positively by Pakistanis, refugees are now associated with the extremist groups responsible for unpopular “terrorist” attacks in Pakistan. Some of the fighters linked to these groups are believed to be former Mujahedin. “Many people believe Afghans are involved in terrorism or crime. This idea has been reinforced by the official attitude towards them,” Asif Khan, who works with local NGO Afghan Friends, told IRIN. Everybody is blaming Pakistan for whatever happens. Nobody asks what the world community has done in 10 years and where the one trillion dollars went. Despite the challenges, many Afghans have managed to create a niche for themselves in their new home. After all, many of them were born and raised in Pakistan. “I feel more Pakistani than Afghan. I play cricket, speak Urdu more often than Pashto and celebrate Pakistan’s Independence Day on 14 August with my friends,” Farid Ali told IRIN from the city of Karachi. The 16-year-old, born and raised in Pakistan, said he had never faced discrimination and had many Pakistani friends. “I know nothing about Afghanistan really. This is my home,” he said. HRCP said in its report that many Afghans have succeeded in integrating into local society in cities, sometimes marrying into local families and gaining an education at top notch colleges. The commission said this raises questions about the actual number of refugees in the country as a significant number have now gained the right to Pakistani nationality through marriage or other forms of integration. His community is one where Afghans and locals live together relatively well. Especially in Pashtun areas, differences between the communities have slipped away as the years pass. But despite Ali and Khan’s positive outlooks, in large urban centres like Karachi, disenchantment among the local population is growing; especially as Afghanis are caught up in the ethnic warfare stalking the port city.